The Lake District and Yorkshire Dales national parks are to be extended by 188 square miles - an area bigger than the Isle of Wight. The Yorkshire Dales will be extended to the north and west and the Lakes to the east and south. The changes, which take effect next August, bring the boundaries of the two parks close to either side of the M6. The move was announced by the Department for Environment, Food and Rural Affairs (Defra). Elizabeth Truss, Secretary of State for Environment, said the parks were part of the UK's "national identity". "I am delighted to be able to announce this extension which will join these two unique National Parks and protect even more space for generations to come," she added. 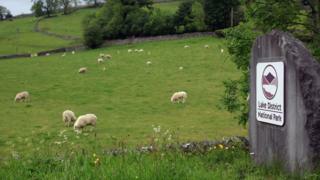 The move will see the Yorkshire Dales grow by nearly 24% and Lake District by 3%. The west is set to extend to Barbon, Middleton, Casterton and Leck Fells, the River Lune, and part of Firbank Fell and other fells to the west of the River Lune. The Country Land and Business Association (CLA) criticised the extension, saying it ignored the views of farmers and landowners. Dorothy Fairburn, CLA North Regional Director, said: "We share the ambitions of boosting rural growth and caring for our landscapes, but we are clear that the flexibility for change - which is critical for a modern, working countryside - should not be stifled. "We are disappointed that the public inquiry and the secretary of state appear to have ignored the views of many of our members who own and manage over 100,000 acres of land affected by this decision, and who also run many rurally-based businesses, some of which are involved in the visitor economy." Plans to extend both national parks were first mooted by Natural England in 2009. A public inquiry was launched in 2013 after five local authorities objected. After hearing more than 3,000 objections and representations, it was recommended the extensions be approved. It is hoped the move will boost rural tourism in the area and potentially add millions to the £4bn already generated by visitors to the parks.